Over the Memorial holiday weekend, I came across this antique car, sitting ever so pretty by the side of the road. Its owner had wandered over to an adjacent fishing pier, so I thought I might have time to give it a go. Just as I was finishing she came back, jumped in, and drove off. The good news is that I was almost finished... the bad news is that I never got to see what kind of car it was. Well, that is not completely true... I could easily see that it was a very CUTE car (I just don't know what make and model it was)! Love old cars. This one is adorable! Happenstance is a great thing. Thank you, Sharon! I love happenstance! 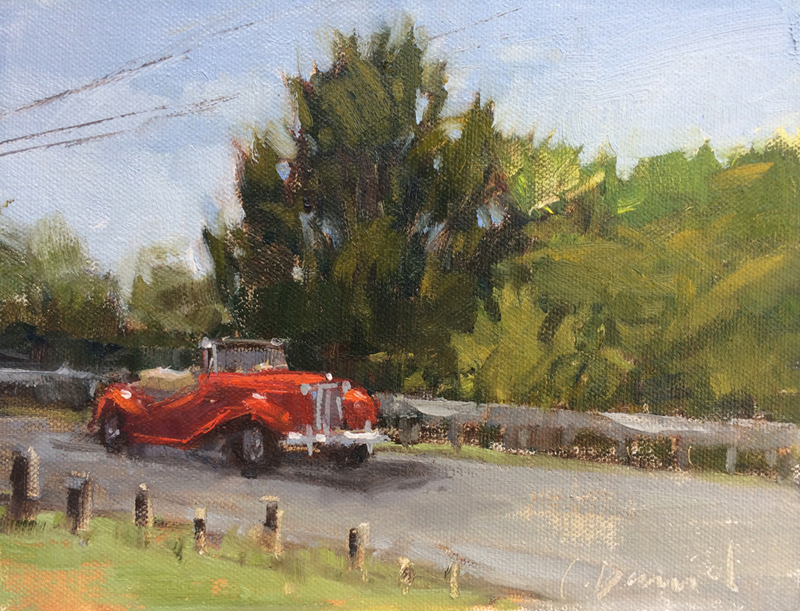 That is one the greatest things about plein air… so often my subject is revealed to me in real time. It’s a fun surprise.